Mecca (Makkah) in Saudi Arabia is Islam's holiest city and the birthplace of the prophet Muhammad, the founder of the Islamic faith. Over a billion Muslims around the globe face Mecca in devout prayer five times daily. The Holy Koran dictates that all Muslims in good health with adequate finances must make a pilgrimage (called the Hajj) to Mecca at least once in their lifetimes. About two million Muslims (from some 100 countries) make this religious journey each year. The visits are concentrated in the last month of the Islamic calendar. The city bursts at the seams during this peak period. 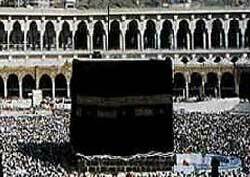 Mecca's focal point is the sacred black Ka'ba (see photo). This outdoor, near-cubic structure is draped in black and houses the holy Black Stone that Muslims believe was given by heaven to the prophet Abraham. As they pray, hundreds of thousands of shoulder-to-shoulder pilgrims circle the Ka'Ba in moving concentric rings. Each pilgrim must complete seven circuits. The Ka'ba is surrounded by the Great Mosque, which in turn is encircled by the city of Mecca. Only Muslims may visit Mecca. Non-Muslims who sneak into this holy city risk dire consequences.